Sarah's Rags: THE BIG PINK AND ORANGE AND BROWN WAVY LINE RUG IS ACTUALLY FINISHED!!!!!!!!!!!!!!!!!!!!!!!!! 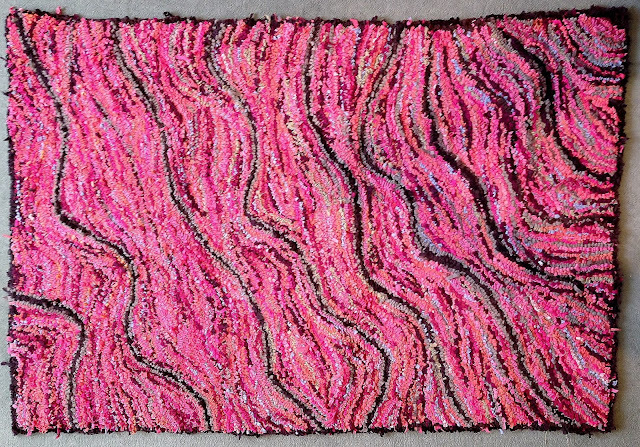 THE BIG PINK AND ORANGE AND BROWN WAVY LINE RUG IS ACTUALLY FINISHED!!!!!!!!!!!!!!!!!!!!!!!!! This shows you what I have done on the back. After poking all ends to the front (using a bodger) and trimming the whole rug, I ironed fusible interfacing to the whole back surface. I trimmed the allowance round the edges of the canvas to roughly the same all round, 2-3 inches, and glued it down with Everbuild Stick2 Instant Spray Contact Adhesive All Purpose High Strength Bond. It is a very easy to apply spray. I considered latex but decided against it, on the grounds that our climate is essentially damp and latex backing does not breathe well. Then I pinned, basted and sewed strong petersham binding to a piece of canvas cut to size, a couple of inches shorter and wider than the finished rug size. That's the zigzag line you can see on this picture. I didn't bother to use co-ordinating yarn, I just used what was on my sewing machine. Then I glued this backing canvas piece to the back of my rug: first I rolled it into a sausage, then unrolled it gluing it down a few inches at a time, stamping it down with my knees as I went along. This was fun. Lastly I whipstitched the petersham binding to keep it all together. There are a few daggy bits of thread on the back and some of my basting thread won't come out because I didn't bother to pull out the basting thread before using the GLUE, soddit! This final bit of sewing hurt. It was tough on my hands, my fingers got very sore on the canvas and I was quite bad tempered with Dan when he asked if I was going to bed yet. Below is the FINISHED ARTICLE. One handmade hooked rag rug. Materials: hessian canvas and recycled cotton textiles. I am WELL PLEASED. Now what do I do with it? PS I have turned part of our top floor landing into my sewing area. This is the first time I've ever had a dedicated sewing space. For sewing to be enjoyable, it helps if there is a place you can retreat to for a few minutes at a time without worrying about tidying up and such. Just read your step by step description of how you finished the rug off which are very useful - I've sometimes used latex which is messy, smelly and makes the rug very heavy! Thanks Ruth - I would never have persevered without your encouragement! just wonderful!! how did your parents like them? ?